Glenn Lewis Frey (/fraɪ/; November 6, 1948 – January 18, 2016) was an American singer, songwriter, actor and founding member of the rock band the Eagles. Frey was the lead singer and frontman for the Eagles, roles he came to share with fellow member Don Henley, with whom he wrote most of the Eagles' material. Frey played guitar and keyboards as well as singing lead vocals on songs such as "Take It Easy", "Peaceful Easy Feeling", "Tequila Sunrise", "Already Gone", "James Dean", "Lyin' Eyes", "New Kid in Town", and "Heartache Tonight". Frey was born in Detroit, Michigan. Growing up in Royal Oak, Michigan, he studied piano at age five, later switched to guitar, and became part of the mid-1960s Detroit rock scene. One of his earliest bands was called the Subterraneans, named after Jack Kerouac's novel, and included fellow Dondero High School classmates Doug Edwards (later replaced by Lenny Mintz) on drums, Doug Gunsch and Bill Barnes on guitar and Jeff Hodge on bass. Immediately after graduating from Dondero in 1966, he was invited to join The Four of Us, a local band led by Gary Burrows who had seen him performing with the Subterraneans. Frey also attended Oakland Community College while in the band, and he learned to sing harmonies performing with The Four of Us. In 1967, he formed the Mushrooms with Gary Burrows' brother Jeff, Bill Barnes, Doug Gunch, and Larry Mintz. That year Frey also met Bob Seger, who helped Frey get a management and recording contract with a label formed by Seger's management team, Hideout Records. Seger also wrote and produced the band's first single, "Such a Lovely Child", and the band made television appearances to promote it. Frey had intended to join Seger's group but his mother blocked that course of action for smoking cannabis with Seger. In the later part of 1967, Frey also pulled together another band called Heavy Metal Kids with Jeff Burrows (piano), Jeff Alborell (bass), Paul Kelcourse (lead guitar) and Lance Dickerson (drums). In 1968, at age 19, Frey played the acoustic guitar and performed background vocals on Seger's single, "Ramblin' Gamblin' Man". Frey has said that Seger strongly encouraged and influenced him to focus on writing original songs. They remained good friends and occasional songwriting partners in later years, and Frey would also sing on Seger's songs such as "Fire Lake" and "Against the Wind". In Detroit, Frey also met and dated Joan Sliwin of the local female group The Mama Cats, which became Honey Ltd. after the group moved to California in 1968. Frey went to Los Angeles hoping to reconnect with his girlfriend, and he was introduced to J. D. Souther by her sister, Alexandra Sliwin, who was with Souther at the time. Frey returned to Detroit after three weeks, but then went back again to Los Angeles to form a duo with Souther called Longbranch Pennywhistle. They were signed to Amos Records and released an eponymous album in 1969, which contains songs he wrote such as "Run, Boy, Run" and "Rebecca", and "Bring Back Funky Women" he co-wrote with Souther. Frey also met Jackson Browne during this period. The three musicians lived in the same apartment building for a short time, and Frey later said that he learned a lot about songwriting from hearing Browne work on songs in the apartment below. Frey met drummer Don Henley in 1970. They were signed to the same label, Amos Records, at that time and both spent time at the Troubadour. When Linda Ronstadt needed a backup band for an upcoming tour, her manager John Boylan hired Frey because he needed someone who could play rhythm guitar and sing. Don Henley was approached by Frey to join Ronstadt. Randy Meisner and Bernie Leadon were also hired, although as the backing band personnel changed through the tour, the four had only played once together at a gig at Disneyland. Frey and Henley decided to form a band together while on the tour, and they were joined by Meisner on bass and Leadon on guitar, banjo, steel guitar, mandolin and dobro, forming the Eagles, with Frey playing guitar and keyboards and Henley playing drums. The band went on to become one of the world's best-selling groups of all time. Frey wrote or co-wrote (often with Henley) many of the group's songs, and sang the lead vocals on a number of Eagles hits including "Take It Easy", "Peaceful Easy Feeling", "Already Gone", "Tequila Sunrise", "Lyin' Eyes", "New Kid in Town", "Heartache Tonight" and "How Long". The Eagles' album Long Road Out of Eden was released in 2007, and Frey participated in the Eagles' Long Road Out of Eden Tour (2008–2011). In May 2012, Frey was awarded an honorary Doctorate of Music from Berklee College of Music along with Henley, Joe Walsh and Timothy B. Schmit. In 2013, the two-part documentary History of the Eagles, directed by Alison Ellwood and co-produced by Academy Award winner Alex Gibney, was aired on Showtime. The documentary won an Emmy Award in 2013 for Outstanding Sound Mixing For Nonfiction Programming. An accompanying two-year History of the Eagles world tour ended on July 29, 2015 at Bossier City, Louisiana, a concert which would be Frey's final public appearance with the band. After the Eagles disbanded, Frey achieved solo success in the 1980s, especially with two No. 2 hits. In 1984, he recorded in collaboration with Harold Faltermeyer the worldwide hit, "The Heat Is On", the main theme from the Eddie Murphy action comedy film Beverly Hills Cop; then, Frey performed "You Belong to the City" (from the television series Miami Vice, the soundtrack of which stayed on top of the U.S. album charts for 11 weeks in 1985). His other contribution to the soundtrack, "Smuggler's Blues", hit No. 12 on the Billboard Hot 100. During his solo career, Frey had 12 charting songs in the U.S. Top 100. Eleven of those were written with Jack Tempchin who also wrote "Peaceful Easy Feeling". Frey was the first choice to record "Shakedown", the theme for the film Beverly Hills Cop II. Frey did not like the lyrics and then came down with laryngitis, so the song was given to Bob Seger. After the song went to number one, Frey called to congratulate Seger, saying "At least we kept the money in Michigan!" Frey also contributed the song "Flip City" to the Ghostbusters II soundtrack, and "Part of Me, Part of You" to the soundtrack for Thelma & Louise. In 2005, he appeared on B.B. King & Friends: 80 on the track "Drivin' Wheel". As a television actor, Frey guest starred on Miami Vice in the first-season episode "Smuggler's Blues", inspired by his hit song of the same name, and had a starring role in the "Dead Dog Arc" of Wiseguy. He was also the star of South of Sunset, which was canceled after one episode. In the late 1990s, he guest-starred on Nash Bridges as a policeman whose teenage daughter had run amok and gone on a crime spree with her sociopathic boyfriend. In 2002, he appeared on HBO's Arliss, playing a political candidate who double-crosses Arliss and must pay a high price for it. Frey's first foray into film was his starring role in Let's Get Harry, a 1986 film about a group of plumbers who travel to Colombia to rescue a friend from a drug lord. Frey's next film appearance was a smaller role in Cameron Crowe's third film, Jerry Maguire (1996). Frey played the frugal general manager of the Arizona Cardinals football team who, in the film's climax, finally agrees to pay Cuba Gooding Jr.'s character, wide receiver Rod Tidwell, a large professional contract. From about 2000, Frey had suffered from rheumatoid arthritis, which affected various joints of his body. The medication that he was prescribed to control the disease eventually led to colitis and pneumonia, and in November 2015, the Eagles announced that they were postponing their appearance at the Kennedy Center Honors as Frey required surgery for intestinal problems and a lengthy recovery period. Following surgery, he was placed in a medically-induced coma at Columbia University Medical Center. Frey died there on January 18, 2016 at the age of 67 from complications of rheumatoid arthritis, acute ulcerative colitis, and pneumonia, while recovering from gastrointestinal tract surgery. Medications for rheumatoid arthritis or ulcerative colitis can compromise the immune system's ability to fight off pneumonia. In January, 2018, Frey's wife filed a suit against Mount Sinai Hospital and gastroenterologist Steven Itzkowitz for the wrongful death of Frey. Frey was publicly mourned by his friends, fellow musicians and bandmates including Don Henley, Randy Meisner, J. D. Souther, Jack Tempchin, Irving Azoff, Linda Ronstadt, Don Felder, and Bob Seger. At the 58th Annual Grammy Awards, the remaining members of the Eagles and Jackson Browne performed "Take It Easy" in his honor. A life-sized statue of Frey was unveiled at the Standin' on the Corner Park in Winslow, Arizona, on September 24, 2016, to honor his songwriting contributions to "Take It Easy", made famous by the Eagles as their first single in 1972. The road that runs next to the high school he attended now bears his name. ^Note A The song reached No. 12 on the Bubbling Under Hot 100 chart. Takamine Guitars manufactures a Glenn Frey signature acoustic-electric guitar, the EF360GF. It is designed to replicate the Takamine Frey used for his live and studio applications. In the 1970s, Frey used Martin acoustic guitars in both six- and 12-string versions. Frey played assorted electric guitars over the years, namely Fender Telecaster, Gibson Les Paul, Gibson SG, Gibson ES-330, Epiphone Casino and Rickenbacker 230, but the electric guitar that is most associated with him was his black Gibson Les Paul Junior, nicknamed Old Black. ^ Eder, Bruce; Ankeny, Jason. "Glenn Frey Biography". AllMusic. Retrieved April 16, 2010. ^ a b Smith, Harrison (January 18, 2016). "Glenn Frey, guitarist for the Eagles, dies at 67". The Washington Post. ISSN 0190-8286. Retrieved January 19, 2016. ^ a b c d "MRRL Hall of Fame: Glenn Frey". Michigan Rock and Roll Legends. Retrieved July 10, 2014. ^ a b c d e McCollum, Brian (January 19, 2016). "Glenn Frey details Detroit days in Free Press interview". Detroit Free Press. ^ Eliot, Marc (1998). To the Limit: The Untold Story of the Eagles. Da Capo Press. p. 25. ^ Browne, David (January 28, 2016). "Glenn Frey: An Oral History". Rolling Stone. ^ Paterson, Beverley (February 18, 2014). "Forgotten series: Glenn Frey and the Mushrooms, "Such A Lovely Child/Burned" (1967)". Something Else. ^ "Readers' Poll: The 10 Best Bob Seger Songs – 8. 'Ramblin' Gamblin' Man'". Rolling Stone. Retrieved January 21, 2014. ^ "Glenn Frey Talks Bob Seger And Woodward Avenue". WOMC. March 5, 2013. Retrieved January 23, 2014. ^ Eliot, Marc (1998). To the Limit: The Untold Story of the Eagles. Da Capo Press. p. 40. ^ Hilburn, Robert (May 23, 1982). "The Eagles - The Long Run is Over". Los Angeles Times. ^ Eliot, Marc (1998). To the Limit: The Untold Story of the Eagles. Da Capo Press. p. 351. ^ Simmons, Bill (August 14, 2013). "The Eagles' Greatest Hit". Grantland. Retrieved January 19, 2016. ^ History of the Eagles. 2013. Event occurs at 27:15–28:10. ^ Eliot, Marc (2004). To The Limit: The Untold Story of the Eagles. Da Capo Press. pp. 58–62. ISBN 9780306813986. ^ Ruhlmann, William. "Eagles – Artist Biography". AllMusic. All Media Network. ^ Vorel, Jim (September 27, 2012). "Eagles tribute band landing at Kirkland". Herald & Review. Retrieved January 18, 2013. ^ Subramanian, Courtney (August 21, 2013). "10 Band Reunions that Rocked". Time. Retrieved January 19, 2016. ^ Kakkar, Ana (July 11, 2013). "The Eagles: Breakup, The Reunion, & The Long Road Out Of Eden". Spotify. Retrieved July 10, 2014. ^ "Eagles and Alison Krauss get Berklee honorary doctorate". music-news.com. Retrieved January 10, 2017. ^ "Jack Tempchin | Songs". AllMusic. Retrieved January 18, 2016. ^ Bronson, Fred (2003). "672 Shakedown - Bob Seger". The Billboard Book of Number One Hits. Billboard Books. p. 681. ^ Erlewine, Stephen Thomas. "80 – B.B. King". AllMusic. Retrieved January 19, 2016. ^ Morris, Chris (February 14, 1998). "Frey Goes Indie with Mission Startup". Billboard. p. 65. Retrieved July 10, 2014. ^ Advertising, OJ. 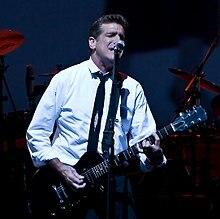 "Michigan Rock and Roll Legends - GLENN FREY". www.michiganrockandrolllegends.com. ^ "About Glenn Frey". MTV. Retrieved July 10, 2014. ^ Perrone, Pierre (January 20, 2016). "Glenn Frey: Singer and songwriter who co-founded the Eagles, the biggest-selling American rock band of all time". independent.co.uk. Retrieved September 18, 2016. ^ "Glenn Frey's Children: The Music Legend's Family". ^ "Glenn Frey's son Deacon joins Eagles as the band eyes a new tour". November 20, 2017. Retrieved April 21, 2018. ^ a b Kenneally, Tim; Waxman, Sharon. "Glenn Frey's Medication Contributed to His Death, Manager Says". thewrap.com. Retrieved January 18, 2016. ^ Kreps, Daniel (November 7, 2015). "Eagles Postpone Kennedy Center Honors Due to Glenn Frey's Surgery". Rolling Stone. ^ Li, David K. "Eagles manager says arthritis pills played role in Frey's death". pagesix.com. ^ "The Eagles' Glenn Frey dead at 67". CNN. January 18, 2016. Retrieved January 18, 2016. ^ Morton, Victor (January 18, 2016). "Glenn Frey, Eagles guitarist, dies at 67". The Washington Times. Retrieved January 18, 2016. ^ Staff (January 18, 2016). "Founding Member Of Eagles Glenn Frey Dies At 67, Band's Website, Rep Report". CBS News. Retrieved January 18, 2016 – via CBS Los Angeles. ^ Kenneally, Tim. "Glenn Frey's Death: Rheumatoid Arthritis Medication Can Lead to 'Disaster,' Doctor Says". The Wrap. Retrieved November 5, 2017. ^ "Widow Of Glenn Frey Sues Hospital Over Husband's Death - Noise11.com". www.noise11.com. ^ "It Is With The Heaviest of Hearts That We Announce…" (Press release). Eagles. January 18, 2016. Retrieved January 19, 2016. ^ Grow, Kory (January 18, 2016). "Don Henley on Glenn Frey: 'He Changed My Life Forever'". Rolling Stone. Retrieved January 19, 2016. ^ Dillon, Nancy (January 19, 2016). "Eagles bassist Randy Meisner sad he and the late Glenn Frey can't 'Take It to the Limit' one more time". Daily News. New York. ^ Cashmere, Paul (January 20, 2016). "Music News JD Souther Issues Statement About Glenn Frey". Noise11.com. Retrieved January 20, 2016. ^ Cashmere, Paul. "Jack Tempchin Shares Thoughts About Glenn Frey". noise11.com. Retrieved January 21, 2016. ^ Waddell, Ray (January 18, 2016). "Eagles Manager Irving Azoff 'Heartbroken' Over Death of Glenn Frey: 'I Can't Believe He's Gone'". Billboard. Retrieved January 19, 2016. ^ Lewis, Randy (January 19, 2016). "Linda Ronstadt, whose backing band was the hub for the Eagles, remembers Glenn Frey". Los Angeles Times. ^ DeRiso, Nick (January 19, 2016). "Don Felder Pays Tribute to Glenn Frey's 'Amazing Genius'". Ultimate Classic Rock. Retrieved January 19, 2016. ^ Kreps, Daniel (January 18, 2016). "Bob Seger on Glenn Frey: 'He Was the Leader of the Eagles'". Rolling Stone. Retrieved January 19, 2016. ^ Rys, Dan (February 15, 2016). "Jackson Browne, Eagles Members Pay Tribute to Glenn Frey With 'Take It Easy' at the 2016 Grammys". Billboard. ^ "Winslow gets life-sized statue of the Eagles' Glenn Frey". September 28, 2016. Retrieved October 29, 2016 – via 12news.com. ^ "Street in Royal Oak named after late rock star Glenn Frey". wxyz.com. February 19, 2016. Retrieved March 11, 2018. ^ "Gold & Platinum – Glenn Frey". RIAA. Retrieved January 18, 2016. ^ a b "Glenn Frey | Awards". AllMusic. Retrieved January 18, 2016. ^ "Results – RPM – Library and Archives Canada". Collectionscanada.gc.ca. Retrieved July 19, 2010. ^ "Glenn Frey". Chart Stats. Archived from the original on August 19, 2011. Retrieved July 19, 2010. ^ Hung, Steffen. "Swedish Charts Portal". swedishcharts.com. Retrieved July 19, 2010. ^ Hung, Steffen. "Die Offizielle Schweizer Hitparade und Music Community". Hitparade.ch. Retrieved July 19, 2010. ^ "Glenn Frey – Chart History: Billboard 200". Billboard Nielsen Business Media. ^ Sinclair, Paul (March 16, 2018). "Glenn Frey / Above The Clouds: The Collection / new four-disc package". superdeluxeedition.com. Retrieved May 15, 2018. ^ "Glenn Frey - Chart History - The Hot 100". Billboard. ^ "Glenn Frey - Chart History - Mainstream Rock Song". Billboard. ^ a b "Glenn Frey - Awards". AllMusic. ^ "Glenn Frey - Chart History - Adult Contemporary". Billboard. ^ "Top Singles". RPM Magazine. ^ "Adult Contemporary". RPM Magazine. ^ "Glenn Frey". Official Charts Company. ^ "Glenn Frey Limited Edition Rickenbacker". rickenbacker.com. Retrieved July 3, 2017. ^ "Glenn Frey's Gibson Les Paul Junior 1956 Sunburst Electric Guitar". Equipboard.com. Retrieved January 19, 2016.